Late spring brings rhubarb stalks to the markets, and fresh, ripe strawberries signal that summer’s on its way. Just at the crossover of the two seasons there’s a brief opportunity to combine the sweet berries and tart stalks into delicious and memorable desserts. If you are looking for a true culinary revelation, this combination can yield sensational results — just in time for Mother’s Day, Father’s Day or a Memorial Day picnic! This jam enjoys great popularity at breakfast tables in Germany and is a must have at every spring brunch. These thin pancakes with their fresh fruity filling just might become your new brunch favorite. As pretty as it is delicious, this trifle perfectly balances sweet and tart flavors. As delicious as it gets! 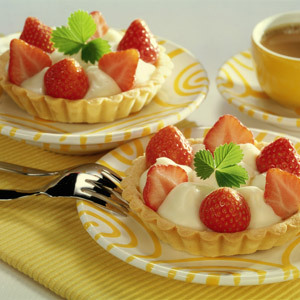 The slightly tart crème fraîche perfectly complements the fresh sweet strawberries. These stunning meringues are heavenly spring treats and perfectly combine sweet and tart flavors. The ingredient known as “Grieß” in German can be substituted by either semolina (available at well-stocked gourmet stores) or the readily available cream of wheat. Semolina is made from a harder wheat grain and will give this dish a nice grainy texture, whereas cream of wheat will blend into the waffle batter.